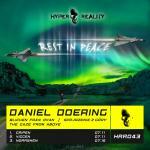 Daniel Doering, it is so heartbreaking to hear you suddenly passed away during a car accident..
We are all still in total shock and we still can't believe this happened to you! It's so hard to comprehend as we even spoke about your forthcoming 3 track EP the day before the accident. We've decided to give this away as a tribute to you, your family and all your fans out there to hopefully comfort the people around you who loved your music. We've made something special for the artwork cover. As you had a love for cars and driving a Saab, for this cover you wished to have 2 Saab Jet Fighters (The Saab 37 Viggen ("Thunderbolt") and (The Saab Jas 39 Gripen ("Griffin") flying above mountains with an Aurora in the sky. We're very grateful we could release your music and we will always cherish your love for quality music. A big loss for the Hard Trance scene, so talented and just too young to pass away..
Rest in peace Daniel, may you look down from the sky and know we all truly love you and your music. +1 DJ Thera .. - Counting Sh..